Ben Copeland asked the big question: "How much growth do we want?" He related it to regional water in the aquifer, rivers, growth, and planning, speaking at the Lake Park Chamber of Commerce annual dinner, 28 January 2011. Copeland is Past Chairman of the Board, Wiregrass Technical College. He serves on the regional water planning council. He said those councils were started due to worries about Atlanta not having a reliable water supply. He said the councils were planning for water and wastewater to 2050. 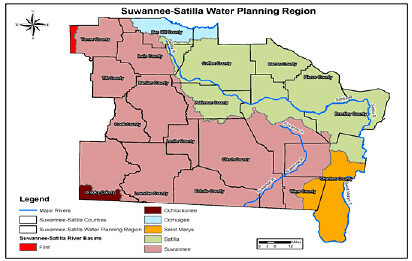 The local regional council is the Suwannee-Satilla regional water council. He described the extent of the water planning region (see map). He expects finalization of the water plan by May. He talked about the Floridian aquifer, and how he's worried not so much about Atlanta taking our water as about Orlando, Jacksonville, and Tallahassee. "Because they all have their straws in that same aquifer." Finally, Ben Copeland asked the big question: "How much growth do we want?" "Do we want to be Jacksonville? Do we want to be Tallahassee? Do we want to be a large metropolitan region? Folks are going to move to south Georgia, I can tell you that, because of all the resources that we have. I'm a great believer in the free enterprise system. How much do we try to limit that? I don't know; that's a good question. I know that Lowndes County and all the rest of it, how do you have high and low growth at the same time. I don't have any answers for that. People need to be informed; need to be aware; that we have to use resources very very carefully; at the same time in a way that provides jobs to our citizens for prosperity." by Gretchen Quarterman for LAKE, the Lowndes Area Knowledge Exchange. Here's a playlist for all five videos of Ben Copeland's remarks about water. This seems to be a very core question. Water is a determining factor in growth, like it or not. How much do we plant to provide to the industries in the area and how much for the residents. Should the number of jobs created or the type of jobs be a determining factor in deciding on whether an industry is a good choice for our community? Thank you for sharing this video and the important issues it raises.